Graduated in 2002 at the University of Turin in History of Italian Language, in 2007 she applied at the Academy of Fine Arts of Turin for a second degree in History of Contemporary Art. She joined Remedia in 2014 while attending the “Autism and related disorders” course of the Yale Medical School, whose thesis was further developed in an essay about autism and language (Disturbi dello spettro autistico. Osservazioni linguistiche e spunti per un progetto di ricerca, in R. Scarpa, Le lingue della Malattia, Mimesis, 2016, pp. 179-211) and followed by a A Reasonable Compromise, Mimesis, 2016. She has been active for the advocacy of rights of people with disabilities, psychiatric disorders and autism with many not-for-profit organizations. She’s a regular contributor of the magazine «Arte» and her translations and writings have been published by Erickson, Mimesis, Ponte alle Grazie, Skira. For Remedia her focus is on autism in its links with language and visual arts. Other areas of interest are doctor-patient communication and health-care policies. Emma Dal Bianco is interested in acting, drawing, graphics, flower arranging and photography. She made the pictures of Remedia's website and other remedian graphic creations. Cecilia Defilippi received her MA in Italian Literature, Philology and Linguistics from the University of Turin (Italy) in 2017. Her research interests include clinical linguistics, psychopathology of language, pragmatics and the social conceptualization and portrayal of autism and autistic identity. She is currently undertaking an internship at the Department of Modern Languages and European Studies of the University of Reading, UK. She was an active member of the literary reading group «Sogno o Son Testo» at the University of Turin. Beatrice Dema is a PhD Student in Italian Linguistics and Literature at the Department of Humanities of the University of Turin. Member of Remedia since 2014, her research fields are Language of Medicine (forthcoming: La lingua nella semeiotica e nella trattatistica psichiatrica a cavallo tra Ottocento e Novecento: la lezione di Morselli e Tanzi, Conference Proceedings: Capitoli della storia della lingua della medicina, Franco Cesati Editore, 2018) and Clinical Linguistics, especially the language of psychiatric diseases such as psychosis, schizophrenia and eating disorders (B. Dema, L’epistolario di uno psicotico: proposta di analisi, in R. Scarpa, Le lingue della malattia, Mimesis, 2016, pp. 103-178). Gloria Frisone is a Phd Student in anthropology at École Des Hautes Études en Sciences Sociales of Paris. She is working about the contemporary definition of aging and dementia, mostly Alzheimer's disease, in diagnostic and common sense. Her ethnographical research concerns the interaction between the loss of memory and the commemoration practices aimed at building collective identities in contemporary society. Previously, she also carried out ethnographical researches in medical and psychological anthropology about migrants' illness and cultural definition of psychological disorders (Frisone Gloria, « Lorsque le migrant devient patient. La performance narrative dans le rituel thérapeutique », L'Autre, 2015/3, 16, p. 315-325). Alessia Macrì graduated in 2014 at the University of Turin, with a thesis about spontaneous speech in patients with Alzheimer. Meanwhile, she attended the “Scuola di Studi Superiori Ferdinando Rossi” in Turin, deepening connections between ageing and communication (degree in 2016). 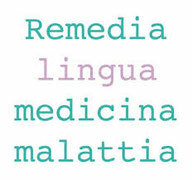 Her contribution to Remedia is focused on language and Alzheimer: La lingua della demenza di Alzhemeir. Analisi linguistica del parlato spontaneo (in R. Scarpa, Le lingue della malattia) shows a productive new way of studying language and degenerative diseases. Graduated in 2002 at the University of Turin in History of Italian Language, she started her research in the Departement of Oncology and Psychiatry of one of Turin's public hospitals. Member of Remedia since 2014, she works for health-care institutions in the area of communication. She is currently engaged in a linguistic research on aphasia. PhD in Philosophy of Mind, Vincenzo Santarcangelo is adjunct professor at the Polytechnic University of Turin. He is a member of the research group LabOnt (University of Turin). His research focuses on philosophy of perception, epistemology and aesthetics of music. For Remedia he is currently working on ontologies in psychiatry. His latest book is Il suono. L'esperienza uditiva e i suoi oggetti (Raffaello Cortina 2018). He writes for Corriere della Sera, Giornale della Musica, Artribune, Il Tascabile Treccani. Raffaella Scarpa teaches Medical and Clinical Linguistics at the University of Turin. She founded Remedia in 2014.